New legislation requiring bars, cafes and restaurants to introduce accessible customer service takes effect this fall. The Customer Service Standard Regulation comes into force in November 2018 and is aimed at helping give all Manitobans access to goods and services. Accessibility advocates are welcoming the change but say the province still has a long way to go. Allen Mankewich, 38, lives with spina bifida, has had to use a wheelchair his entire life and has experienced being unable to get into bars, restaurants and cafes. He enjoys outings with friends, but can’t get into the places they choose to meet. "I don't know if it's a coincidence or what but just in the last few weeks I've had invitations to meet groups of people or go out with people and you know they're suggesting places that aren't wheelchair accessible," said Mankewich. "There's places in the Exchange that because of the age of the buildings and stuff, there's places there that aren't accessible. There's places in Osborne that obviously aren't accessible, there's lots of stairs in Osborne. I think everyone walking down that street would realize that." Patrick Falconer with Barrier Free Manitoba said under the province's building code businesses are only obligated to incorporate accessible entrances, washrooms and seating when there's new construction, change of occupancy or a major renovation. "For existing buildings without there being major renovations inaccessibility is allowed," said Falconer. There are no immediate changes to the building code expected, but Falconer said the Customer Service Standard Regulation is a step in the right direction. "Accessibility's a journey and I think we're making substantial progress, but we've got a long way to go still." The regulation requires Manitoba bars, restaurants and cafes to introduce accessible customer service by November 2018. 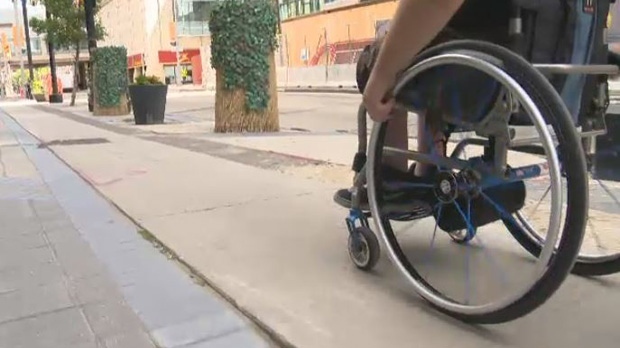 A provincial spokesperson with the Manitoba Disabilities Issues office said accessibility laws are aimed at helping bars and restaurants gain new customers and keep them coming. The province said, for example, under the regulation a restaurant or lounge can continue to have a four-foot high bar with stools to match but should also have other tables available for customers who use wheelchairs or might feel unsteady on a tall or narrow stool. Robert Walker, chairman of the Manitoba Restaurant and Foodservices Association, said the industry is working through the legislation. As for Mankewich, he often finds himself choosing to go to restaurant chains or independently-operated businesses which he knows are accessible.